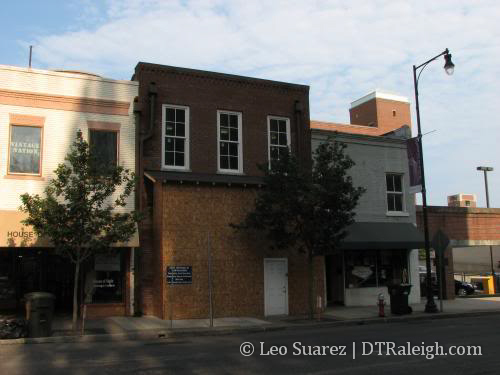 Slowly…very slowly…but surely, Wilmington Street is starting to shed its image as the sore part of downtown. Let’s hope this keeps up! There are a lot of renovations taking place around downtown. Wilmington Str has massive potential for more destination and when The Edison gets completed it will offer even more opportunities. I wish we could do something about Salisbury Str, though. That strip requires attention ASAP!!! Wilmington is also getting a new coat of asphalt. I think it should be finished by now, or nearing completion. Ernest- I’m hoping some developers will pay attention to S. Salisbury St once it’s reopened to traffic from the convention center construction. My hope is that improvements will start on that end, and make their way up towards the capital over time. Plus on North Salisbury Street, the Green Square should start to help things there a good deal. DPK– That’s great news….it’s been long overdue for a repaving! That repaving was most definitely needed. It was probably held up until the heavy trucks coming to RBC Plaza were finished. Let The Edison commence! RaleighRob, Salisbury Str will prove to be an uphill battle, I am afraid, but it is only a matter of time before it gets some attention. In my opinion, the key projects that will determine the future of this street (the CBD section) will be a future redevelopment of the N&O block, the new Justice Center, the revitalization of Sir Walter Raleigh Apts into condos/hotel, the envisioned high-rise that will replace the 414 Fayetteville Str/Sheraton Atrium property, the new convention facilities & hotel, Site 4 and most definitely Site 3. Unfortunately, we are most likely 10 years away from seeing Salisbury Str transforming into something more attractive. While not on Salisbury Str, Clarence Lightner Public Safety Center, a future redevelopment of the Enterprise Car Rentals block and the L Building may also have a positive effect, feeding both McDowell Str – talking about a street that desperately needs improvement – and Salisbury Str. With the N&O block and the Justice Center stretching between the two aforementioned streets, I can only see a positive impact, but the question remains: When? Back to the main topic, I can’t wait until someone redevelops the NE corner of Martin and Wilmington streets. Since the 20+ story residential tower didn’t materialize, I would like to believe that someone with deep pockets will eventually do something with it. The vision was excellent, but without financing this project is doomed to remain in history as “Never Built”. The Edison was a few years away (2010 start of construction for the first of 4 towers) when the economy wasn’t too bad. We can only hope JDavis can talk the talk and get a bankroll to stay on schedule. DPK, The Edison isn’t exactly a project that will be stalled. It was proposed when the lending situation wasn’t good, but the developer has solid financing and we shouldn’t see any bumps along the way. Gregg is more experienced than most local developers, I can assure you. I don’t say that just to make you feel good, believe me. By the way, JDavis is the architect, not the developer. Ooops, yeah for whatever reason I was looking at a picture of the Edison with the filename “jdavis.jpg” and that’s what popped into my head. As for financing I kind of just hold a tongue in cheek approach to any development going on right now. So until I see steel go up on any project, no matter who it’s being developed by, I have an heir of skepticism. I don’t blame you for having doubts and being skeptic, as it is the right approach. We, Raleighites, have reasons to remain down to Earth when it comes to expectations. The only reason why I am optimistic is because I have some information that makes me feel better about The Edison than any other project currently envisioned for DT Raleigh. Of course, I am not suggesting that you should change your mind, by no means. Anything can go wrong between now and the day the cranes appear at the construction site… Your approach is right, though, given that many local developers seem to struggle delivering the goods.